From the moment they arrive, UTP is there for our international students every step of the way. UTP | Welcome to Saint Anthony's High School! Welcome to Saint Anthony's High School, a co-educational, college preparatory high school in South Huntington, New York. Meet some international students from Saint John's High School in West Islip, New York, who are studying with UTP High Schools during their semesters abroad. 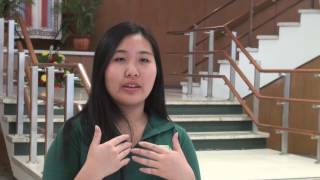 UTP | Meet Thao Tran! Meet Thao Tran from Vietnam. She attends Bishop Guertin in Nashua, New Hampshire. UTP | Meet Manny Paz! Manny, from Mexico, attends Saint Thomas Aquinas in Dover, New Hampshire. UTP | Fairmont Prep - Meet Polly! Meet Polly from Vietnam. She is a student at Fairmont Prep in Anaheim, California.